I started coaching Ashley Bowman in November 2013 and prepped her for her very first figure competition in Hollywood on April 26th 2014. Although she made a considerable physique transformation, she was in great shape when we first started training together. Because I have been prepping athletes for competition since 2008, my experience has taught me that it’s best to be patient and allow your body time to adapt to a new training and diet regimen, rather than jumping straight into a standard 3- month contest diet. Ashley and I both agreed that it would be best to give ourselves 5 months. We had two months to increase strength and alter the composition of Ashley’s already muscular frame. We reduced the amount of cardio she was doing, and gradually increased her calories largely by increasing her protein consumption. To Ashley’s surprise, when we increased the volume of her weight training sessions, reduced her cardio and increased her calories, her body fat percentage decreased and her metabolic rate increased. This meant she could eat MORE and get leaner. We also had to correct a few postural issues before we could go heavy with chest and shoulder training. We identified a couple of changes that needed to be made to Ashley’s lifting technique that may have been contributing to pain in her right rotator cuff. This was coupled with the issues that many people suffer after long hours each day working at a computer. Ashley is a lawyer and when we met, she had just finished working very long hours on a big case with her firm. We eased off from chest training and pressing movements while we focussed more on back (rear deltoids and lower trapezius) alongside rehab exercises prescribed by Ashley’s Physical Therapist. With persistence, the pain gradually went away, and the imbalances appeared to have been corrected. Ashley was very happy when we were able to go heavy on chest and shoulder workouts again. When we were 6 weeks out from the the competition, we started working extensively on posing. Ashley’s physique was looking amazing at this point and as it was Ashley’s first physique competition, it was important that she had a clear vision of what to do on stage. Once we got got the walk and the poses right, I made sure she practiced over and over again. I made video which we would watch and use to make any adjustments. Ashley studied hard, was extremely disciplined and dedicated all the way through the entire process. She never once complained, and she followed all my advice without argument. She asked questions, and as long as I had a logical answer that she understood, she was happy to trust me 100%. We had a great time on this journey and have become solid friends. Below is Ashley’s own account of our training leading up to the competition. When I first met Judy in October 2013, I had been working out regularly (running and lifting weights 5-6x a week) for a while, but didn’t have any really fitness goals and hadn’t seen many changes in my body. Judy approached me at the gym where I trained and asked if I’d ever thought of bodybuilding. I wasn’t sure exactly what it entailed, but I figured if it would make my body look anything like hers, I should give it a try. When I began training with Judy about a month later, she set a workout program and nutrition plan for me that were designed to help me reach my goal of competing in figure competition in April 2014. Between mid-November and the end of January 2014, I increased my metabolic capacity and increased from 1800 to 2400 calories while dropping from 21% to 15% body fat. In addition to workouts and nutritional guidance, Judy also helped guide me through the anxiety and insecurities every competitor faces in preparing to compete for the first time. As long as I was willing to put in 100%, Judy was willing to put in 110%. When I finally stepped on stage in April, I was fitter than I’d ever been and had reached the kind of condition I’d previously thought my genetics would never let me achieve. Best of all, finally saw changing my physique as a constructive process to be enjoyed rather than a painful one to suffer through. 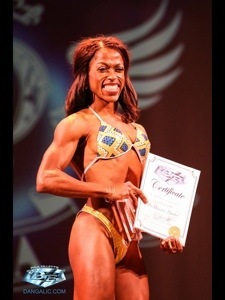 Thanks to Judy, I’m hooked on competing, and the “fitness lifestyle” has become my everyday life! Please take a couple of minutes to watch the video below. It shows the highlights of Ashley’s journey to the stage. Push-ups, posing practice and all. A huge thank you to Ashley for all her hard work, dedication and commitment. As you will see in the video the former rugby player is a phenomenal athlete all round, and a true honour to work with.